An international thriller, 2015’s Survivor introduces us to Kate Abbott (Milla Jovovich), a security officer at the US embassy in London. She makes it tougher for baddies to get travel visas, and this puts her in their literal and figurative crosshairs. Because of this, an assassin named Nash (Pierce Brosnan) – also known as “The Watchmaker” – gets the assignment to deal with her. He targets her in an explosion at a colleague’s birthday celebration, but because Kate stepped out to buy a present, she escapes serious harm. When Nash realizes this, he attempts to shoot Kate, but she manages to get away from him. This doesn’t leave Kate in the clear, however. Those involved in a major conspiracy frame her for various deadly events. We follow Kate’s attempts to stay alive and prove her innocence as well as stop a terrorist attack that resides at the heart of these events. That sure sounds like a good set-up for an action thriller, so one might expect Survivor to provide a lively tale. Unfortunately, it seems to resolutely, consistently generic that it never gets off the launching pad. Perhaps the problem is that we’ve seen too many movies like this in the past. At its core, Survivor gives off a Hitchcock vibe melded with modern-day conspiracy tales. Both genres fall into the “well-worn” category at this point, but that doesn’t doom the movie to failure. Instead, its lack of inventiveness and creativity kills it. We find too many smart people who do dumb things and too little development along the way. Survivor throws out nuggets of information but it does nothing to bond us to the characters in any way. If we care about Kate, it’s out of a sense of dramatic obligation more than due to anything the movie does. The action also tends to fall flat. Survivor comes with plenty of mayhem, but these scenes fail to add excitement. They seem gratuitous and without much impact. 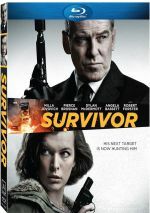 With actors like Jovovich, Brosnan, Angela Bassett, Robert Forster and Dylan McDermott, Survivor boasts a pretty good cast. Unfortunately, none of them offer compelling performances. In an atypical turn as a baddie, Brosnan almost displays a pulse, so he becomes the best of the bunch. That’s a low bar, though, as all the actors get let down by the bland, generic material. All of this leaves Survivor as a disappointment. Based on the story and talent involved, this should’ve become a fairly involving thriller. Instead, it winds up as a forgettable, anonymous effort. Survivor appears in an aspect ratio of approximately 2.40:1 on this Blu-ray Disc. The image seemed pretty positive. Sharpness looked mostly good. A handful of slightly soft shots emerged, but not with regularity or severity. The movie usually seemed tight and concise. Jagged edges and shimmering didn’t cause distractions, and edge enhancement seemed to be absent. Source flaws also failed to pop up in this clean transfer. Teal? Teal! A little orange crept in as well, but the majority of the tale opted for a prominent blue/green feel. As tedious as that was, the colors seemed accurately reproduced within the stylistic choices. Blacks came across as dark and dense, while shadows were smooth and clear. Though not stellar, the image satisfied. While not as impressive, the Dolby Digital TrueHD 5.1 soundtrack of Survivor proved to be more than acceptable. For the most part, the soundfield emphasized atmospheric elements. A few action sequences kicked into higher gear, and these did so well. When necessary, the movie offered a lively, engulfing experience. A featurette called The Making of Survivor lasts five minutes, 25 seconds. In this, we hear from producer Irwin Winkler, screenwriter Philip Shelby, director James McTeigue, and actors Milla Jovovich, Dylan McDermott, Angela Bassett and Robert Forster. The show looks at the project’s roots and development, story/character/script areas, locations and cast/performances. We get a couple of decent insights but most of the program remains superficial and promotional. Five Deleted Scenes fill a total of 10 minutes, 39 seconds. We find “Bill’s Secret” (0:34), “Watchmaker’s Lab” (4:13), “Won’t Get Far That Way” (0:53), “Gas District” (4:31) and “Road Kill” (0:26). These add a little character material and a few action beats but not anything that really changes the finished product. The disc opens with ads for Kidnapping Mr. Heineken, Dawn Patrol, Automata and By the Gun. We also find the trailer for Survivor. Though it packs the surface components to turn into a compelling tale, Survivor seems too generic to succeed. It barely keeps us with it and never threatens to become memorable. 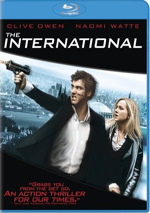 The Blu-ray provides very good picture and audio but lacks substantial bonus materials. While this doesn’t end up as a terrible movie, it remains dull.